After rounds of planning, replanning, cancellation, planning.. and so on, I finally decide to take the plunge and head straight to Bangalore. Some urgent personal work, with some railfanning in the agenda, made this weekend the perfect time for my trip. Accordingly, I booked a ticket on the Bharathi Multi-Axle Mercedes Benz bus leaving on 21st July 2011, with boarding point at Aluva. The day arriving very soon..
An accident near my home meant that the power supply to our area was disrupted. With clouds looming large, it was wet and dark around my home. A short walk from my home, I reached the bus stop to get a bus to Kodungallur (38kms south of Thrissur, Kerala). Had to wait for quite some time to get a bus (the first two that came went without stopping). I got off at Kodungallur, and quickly got the next bus to Parur. As I reached Parur, I got a bus to Aluva as well. Except for the long waiting time near my home, travel to Aluva was a breeze. The bus dropped me well away from the place I needed to go, and this ensued hiring a rick to get to my place. I reached the pick up point (Zam Zam Travels Aluva) at 2035. The bus was scheduled to arrive at 2045. I showed my ticket and enquired if the bus was on time - the reply was affirmative. I decided to remain seated out side the office - it was drizzling on and off, and hence standing on the road was not a choice. 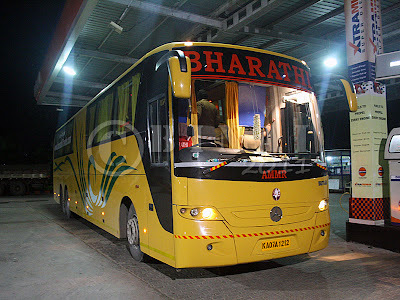 The bus came in at 2050, right behind the KPN Multi Axle to Chennai.The bus, KA-07-A-1212, looked sleek, decked up in Yellow Colour. The attendent (cleaner) and agent of the GSA for Kerala got off the bus. I was the only person to board at Aluva - the attendent took my bag and deposited it in the baggage hold, and the other guy checked my ticket. I got a 'boarding pass' on board the bus soon after we left Aluva. The bus started off from Aluva at 2100. First Impressions: On entering the bus, came a whiff of fresh air. They had used some air freshener, and there was a very good fragrance. The cabin was well lit - the driver cabin looked much better than the two-axle Mercs running with KSRTC. I headed straight to my seat - I1, which was in the 9th row. The bus was about 50% empty. Blankets were already kept on the seat. The attendant came around to check if anyone had any requirements. Soon after the bus left, the attendant came again to distribute water bottles - they gave out 1 litre bottles!! The blanket was fairly big, unlike the ribbon sized shawls that most other operators pass off as blankets. A dubbed movie was being played - the story was too bad to digest - hero kicking off many people at one go, and the heroine falling for the hero's stupid antics. My view of what was happening outside was badly disturbed by the condensation formed on the window glass. This led me to investigate what was happening - there are air vents directed at the windows. These vents cannot be closed - and ends up fogging the windows. This is surely a very bad design flaw - This flaw exists in almost all Indian built buses - wonder why there should be an air vent directed at the windows! In the mean time, we roll into Angamaly - the time was 2118. A couple of passengers join in, and we continue forward. The road was in good shape, and we were cruising at a decent pace. We stopped at Koratty for dinner - The time now was 2128. There are a few decent sized restaurants on the road side, and we stopped at the last of them. This one was attached to a Petrol Bunk - there was a hotel and a US Pizza outlet there. I had dinner from home, and had nothing to do other than loiter around the bus. We started off at 2200 - a 20 minute break turned out to a 42 minute break overall! The bus was back to cruising. The driver made good use of the 4-laned road, and we were surely doing 3 digit speeds. Went below Chalakkudy flyover, but did not stop to pick up anyone. We slowed down after the 4-lane roads ended a while before Mannuthy - we stopped at Mannuthy as well, where the travel agent's guy got off - 2234 hrs. Past Mannuthy, the road was in awful shape. The bus was rolling badly - I was being thrown around badly all the time. A while past Kuthiran ghats, I saw a Shama Multi Axle (the one running Ernakulam-Bangalore) running ahead of us - that guy was very fast, and our bus could not come anywhere close. But we did manage to trail him for a long time. In the mean time, the movie finished and the screens were closed. The curtains were pulled down, and lights were switched off - replaced with night lamps, rather. I had two seats at my disposal, and decided to make full use of the opportunity. I couldn't see anything outside since the windows were fogged badly - and I had nothing much to do other than sleep! I vaguely remember reading "Walayar" on my mobile phone, but continued sleeping soon after. I woke up around 0115, only to see the bus running through Tiruppur - I was shocked! What was the bus doing in Tiruppur?? In the mean time, I fell asleep again! I woke up just as the bus stopped at Tiruppur bus station - 0133 hrs. They unloaded a few parcels and the drivers changed. We started off again at 0138 - that was pretty quick! We stopped again, this time at a petrol pump - 0150hrs. The bus took in a good 260 litres of diesel, while the passengers went out for a leak. The drivers too took a leak, and we started off at 0203. Just as we were moving out, our pairing bus came in. I slept soon after the bus returned to the road - It was one deep sleep - I vaguely remember seeing us cross Salem. The bus did stop somewhere in the middle of the night - perhaps a leak break for the drivers. Both the drivers were sane - they did not overspeed, or do any dangerous heroics on the road. There were no rash overtakes, or hard braking. I was asleep for most of the journey - I woke up only as the bus stopped near the border. We had a very slow crawl till we crossed Attibelle toll gate. The bus took the Electronic city Elevated Highway. I called up my home well in advance, to arrange for my brother to pick me from the bus stop. The bus dropped me at Silk Board flyover exactly at 0613. Overall: It was an awesome journey. The drivers were well mannered - they behaved well on the road. The attendant was also well behaved - he was patiently replying to passengers, and also ensured that he distributed bottles to all passengers. The airconditioner was powerful - but the vents pointed at the windows are a sore to passengers. The windows get fogged, plus the vents ensure that the passenger sitting at the window seat is frozen! This is a serious design flaw that needs to be corrected ASAP. The gangway is too narrow - very tough for passengers with bags to walk through.. no wonder the attendant asked me to leave my bag in the baggage hold. The ride was hard - no wonder the poor roads in India force manufacturers to go for harsh suspensions. The bus had a very good amount of roll - not very comfortable when the bus runs through poor roads. The engine was very noisy inside as well. The AC Vents lack volume control - one can only adjust the direction of air flow. The passengers' control console is very stylish - two spot lights, a small night lamp, a switch to turn off the speaker and two AC vents. The seats were the standard Harita stuff, that one sees on most buses these days. The bus is surely better than the regular Indian buses - but is certainly not the best, only shares the spot with Volvo. Volvo had first mover advantage and they surely cashed on it - they did revolutionise bus travel in India. Mercedes sadly maintains the revolution at the same level - the star doesn't roll much forward! I heard about the Merc bus right from its starting date but don't know abt the travel agency offering booking from Bangalore as well as Ernakulam. Does they offer boarding from Madivala? @Krishnaprasad, They have boarding at Madivala. Their agent is near the Kallada office at Madivala. (I think the name of the agent is "Angel".. not sure). Kallada Multi-axle.. with a decent driver!